During the 1950s and 60s, Bart DeNight’s one-of-a-kind Formula 1 speedster was a force to be reckoned with on the full-scale air racing circuit. Hangar 9 has wonderfully captured the look and feel of the DeNight Special with this exciting sport-scale ARF. 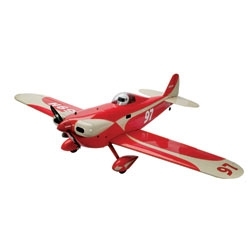 Designed to accept a wide range of glow and electric powerplants, the DeNight Special ARF will give you all the speed and thrills you would expect of a scale-looking air racer without any of the tricky flight characteristics. Assembly takes just a few evenings and most of the details, such as the authentic trim scheme and painted pilot figure, are already added for you.